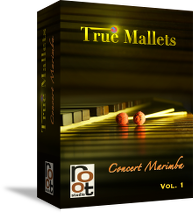 The mallet sounds were not treated in any way in any of these demos (aside from a bit of reverb), so what you hear is what you get. All sounds are taken from the library with a few sprinkles from our Percussive Innuendo library here and there. If you can't see/play the demos, please try the flash page.